Hesitant to do Asheville with kids? 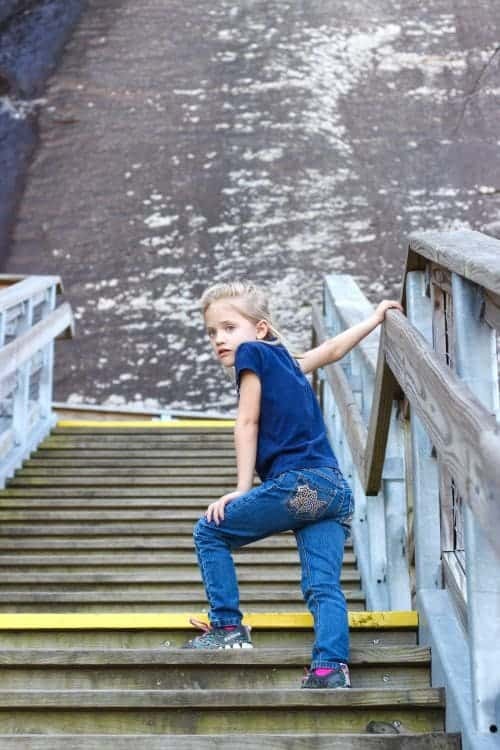 We found kid friendly Asheville a great experience! 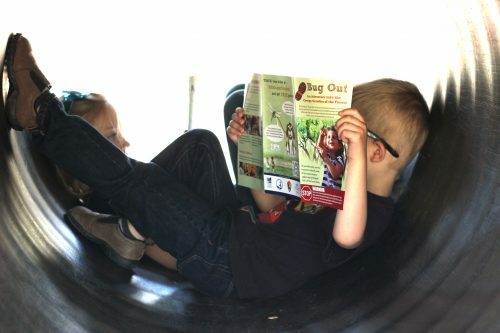 Keep reading for some dining and activity ideas in Asheville for Families. Biltmore – Wait a minute, Jenn.You’re writing about Asheville for families and suggesting I bring small children to tour a mansion? Yep. 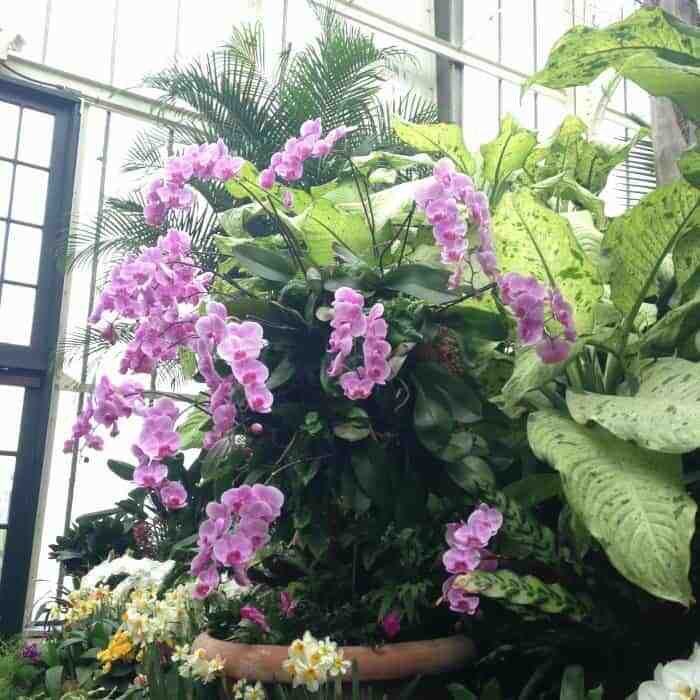 Biltmore house is so over-the-top, kids can’t help but be wowed. Plus, there’s a whole lot more to Biltmore than just the house tour. Check out my 11 tips for Visiting Biltmore to find out if a visit is a good idea during your trip to Asheville with kids. 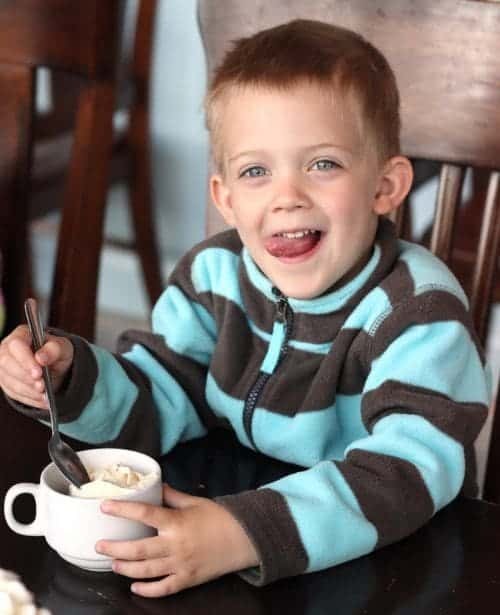 French Broad Chocolates – If your child doesn’t like chocolate or ice cream, well…good for them. For the 99% that love both, a visit to the chocolate lounge at French Broad Chocolates is a must when visiting Asheville with kids. We basically had a chocolate brunch there one day and zero regrets. 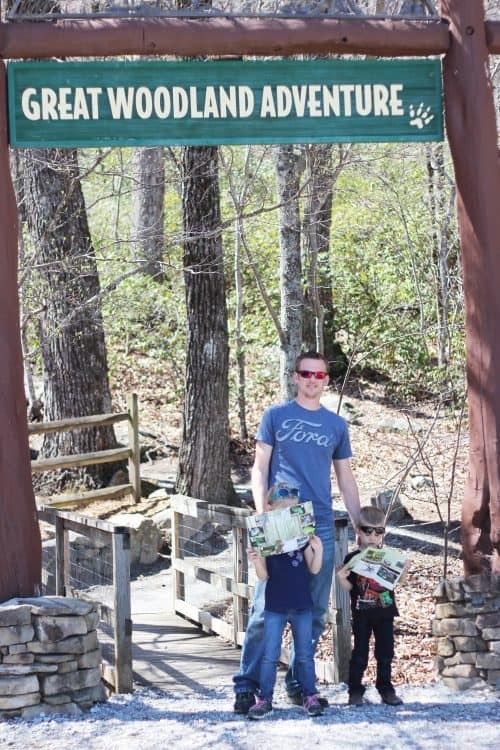 Don’t miss this great spot in Asheville for families! 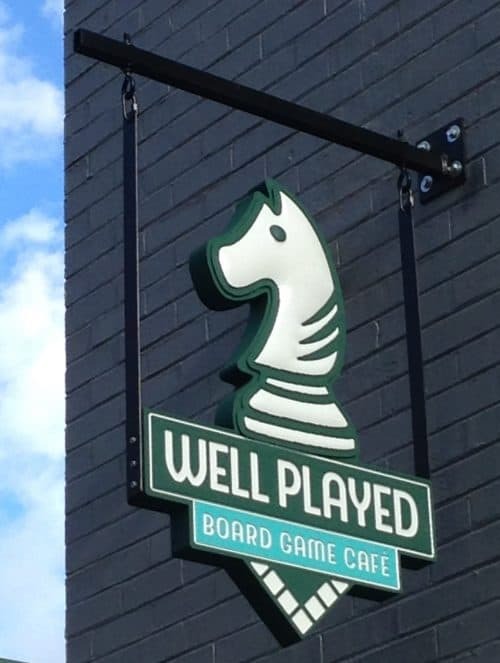 Well Played Board Game Cafe – Kid friendly Asheville just got a little friendlier with the opening of Well Played Board Game Cafe. The concept? Purchase a day pass for $5 per person then come and go as you please all day. 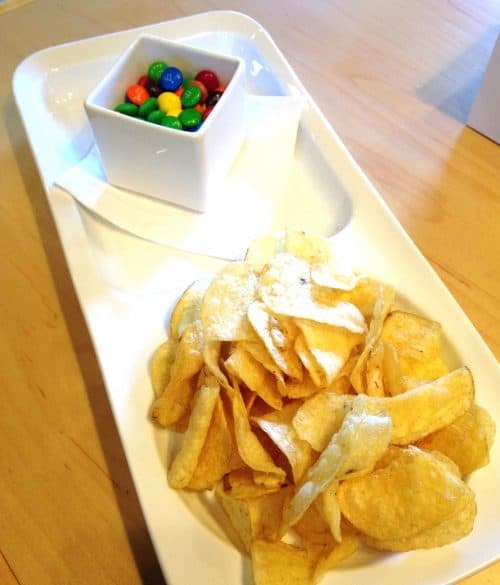 Snacks and a more extensive menu are available as well as drinks, alcoholic and non. Choose from dozens (hundreds? 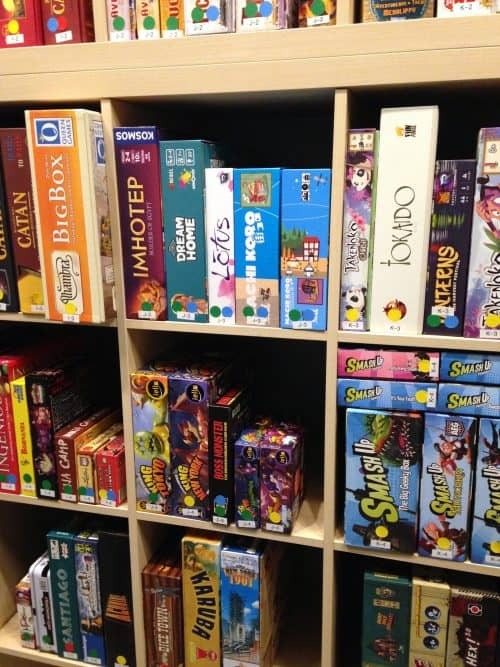 A LOT) of board games for all ages! Whether you’re a family with small children or social role play game enthusiast, you’ll love Well Played. 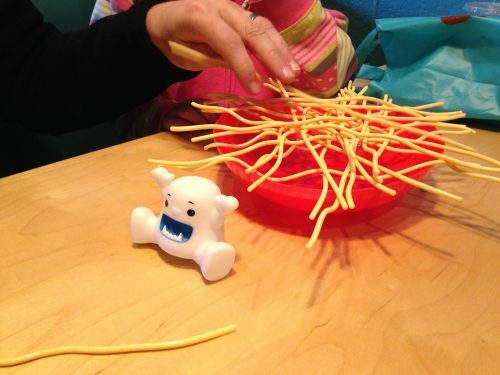 We broke out Yeti in My Spaghetti, Operation, Mousetrap, and a new chicken-themed game we’d never played before. 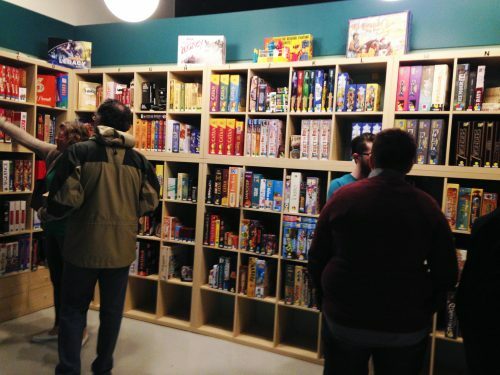 If you show up to Well Played Board Game Cafe solo or your group feels like making new friends, it’s easy to be sociable! Don’t miss out on this fun family experience during your next trip to Asheville! 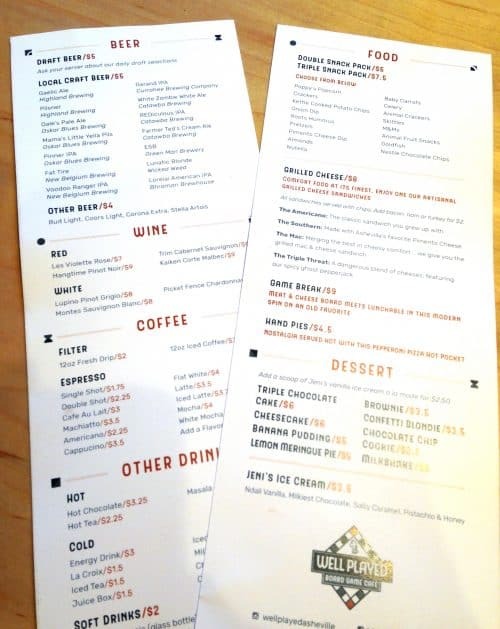 Hayfield Street – Park at Ingles then walk down to The Hop West for some adventurous dairy and vegan ice cream flavors. On your way back to the car, stop at Second Chances Thrift Store. Purchases benefit Brother Wolf Animal Rescue and you might make a couple of furry friends while you shop! The store is incredibly clean and organized. I found an Anthropologie skirt, a Talbots dress, and a Land’s End sweater for Sweet T and several other items all for less than $9 total! The kids enjoyed playing with the toys for sale while I shopped. 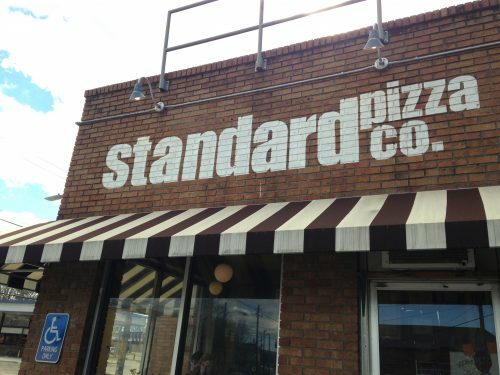 If you’re hungry for lunch or dinner after your ice cream, we all enjoyed Standard Pizza Co. 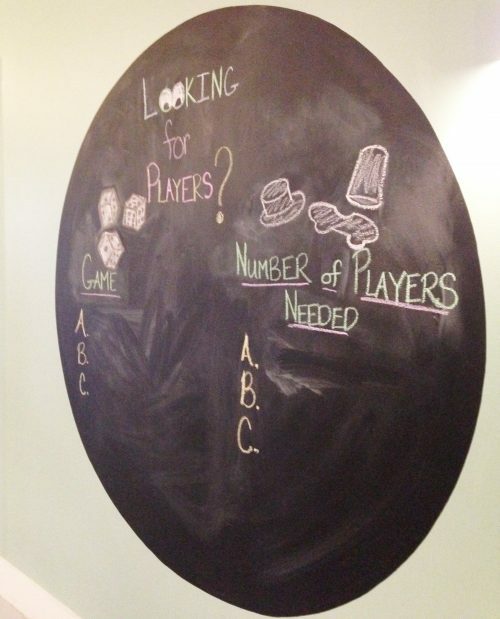 There are games and toys for kids to play with while they wait as well as sidewalk chalk for the patio area. 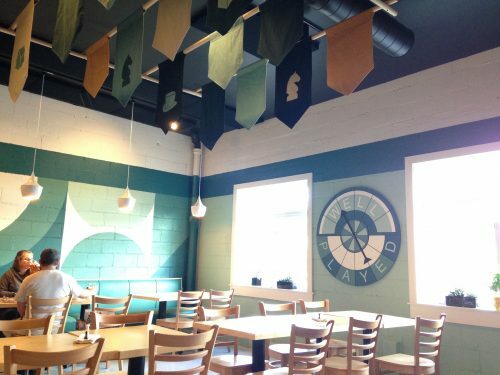 Definitely a kid friendly Asheville spot to eat. Stop at Ingles before you leave to stock up on groceries for your Asheville vacation rental and grab a Redbox movie too! 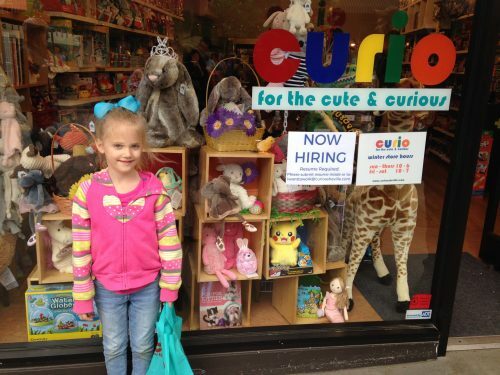 Curio – This toy store carries a variety of quality toys from pretend play to construction sets. On our way to Well Played, we bought the kids some Mad Mattr so they could enjoy some mess-free play back at our Asheville vacation rental and in the car on the way home. 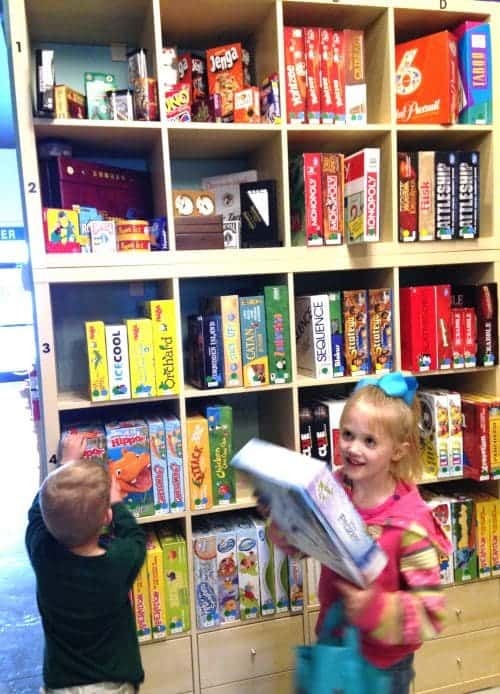 Mast General Store – Filled with all sorts of goodies, Mast will be a favorite with your kids for the candy and toy selections. Each time we went by there was also a street performer out front due to the acoustics under the Mast overhang. One girl was tearing up a fiddle. Impressive. 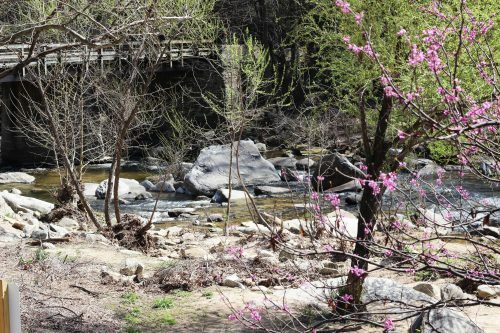 Pritchard Park – Check out Pritchard Park programming if you’re visiting Asheville with kids. We were lucky enough to catch the drum circle. Hula hoops are provided so you can gyrate like nobody’s watching! Chimney Rock State Park – While not exactly Asheville with kids, Chimney Rock State Park lies 27 miles outside of Asheville and is worth the trip. Since we were coming over from visiting family in Charlotte, it was easy to stop by on our way to Asheville. The Great Woodland Adventure Trail is specially designed for kids. Sweet T and Gus often get bored and whiny when we take them hiking, but between the ease of the trail and the frequent stops with interactive elements, they didn’t complain at all. 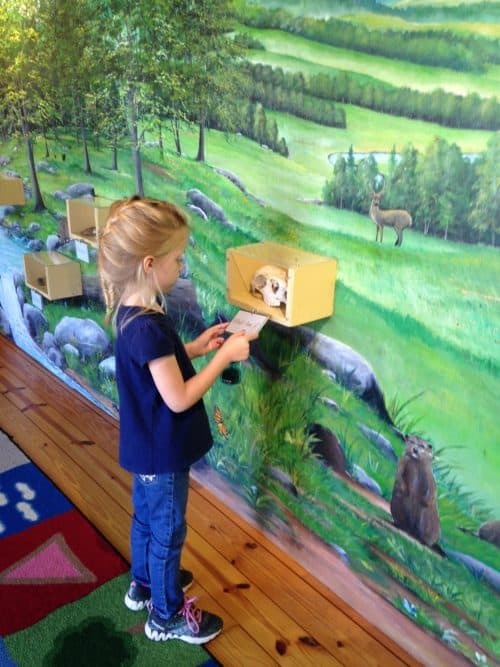 Before you hit the trail, check out Grady’s Animal Discovery Den at the trailhead where you can learn about the animals you’ll see on the trail and check out some live critters too! 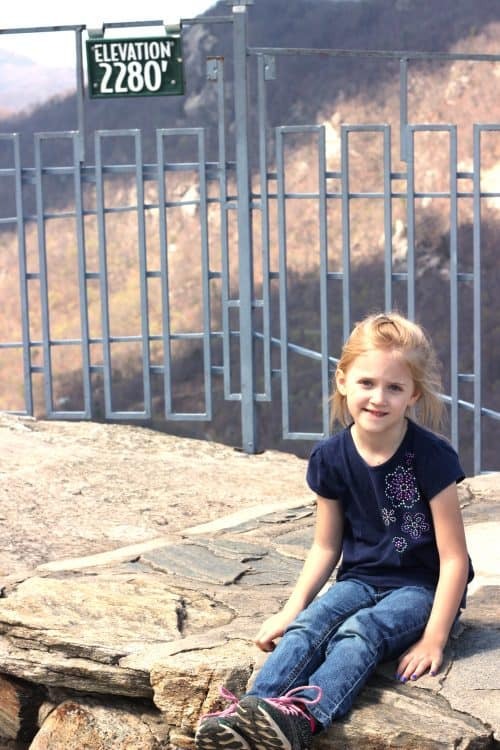 I was skeptical about us making it to the top of Chimney Rock without the aid of the elevator (which is currently undergoing repair) but the kids really rose to the occasion! I tired out before Sweet T did, but she kept us forging ahead. Gus walked up all 500 steps by himself which is a miracle, but he did require carrying about halfway back down. There are frequent places to stop to rest if you need to and we were surprised to see everyone from couples with infants in carriers to people in their 80’s up at the top. Plus dogs…lots of dogs. The view is definitely worth it! You can see about 75 miles away on a clear day. There’s more trails and things to explore at Chimney Rock, but we were tuckered out and hungry after the trail and the climb so we headed to Old Rock Cafe located just outside the gates. 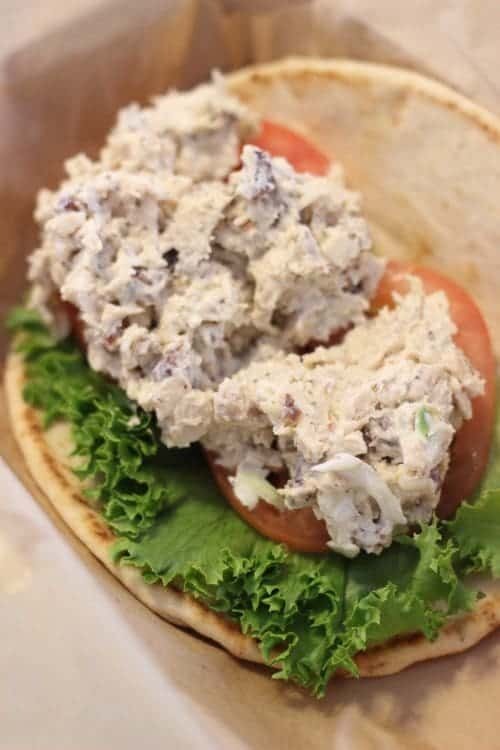 Show them your Chimney Rock admission receipt and get 15% off your meal! You can dine indoors or beside the Rocky Broad River. 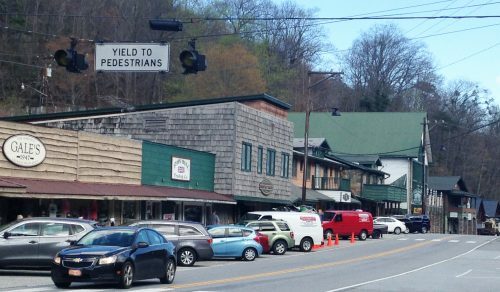 The area surrounding Chimney Rock State Park has that quirky, quaint feel to it that reminds me of Pigeon Forge or Gatlinburg. There’s a little gem mining spot as well as places for old timey, dress-up photographs, coffee, and ice cream. Asheville with kids can be quite an adventure. 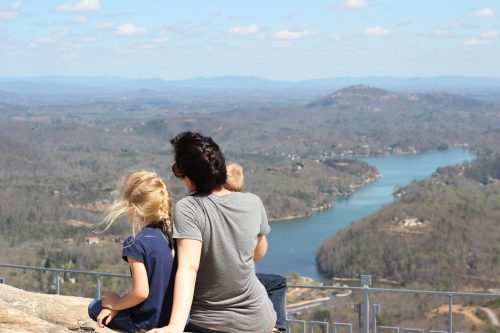 Which kid friendly Asheville tips or destinations would you add to this list of attractions in Asheville for families?